(NaturalSociety) How does defeating one of the biggest fraudulent trade agreements supported by Monsanto, Syngenta, Bayer, DuPont-Pioneer, Dow, BASF and the politicians they own sound to you? Just in case you aren’t familiar with The Trans-Pacific Partnership (TPP) and Transatlantic Trade and Investment Partnership (TTIP), they are huge multinational ‘trade’ deals written by corporations, which are being pushed by the White House and many of our politicians in order to support the ongoing monopoly of our food supply. They are toxic, just like the products these companies sell, but you can stop them with a twitter storm and grass-roots activism. 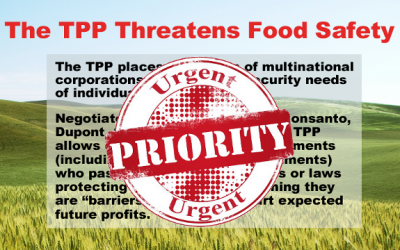 If you aren’t on Twitter, you can also sign a petition or post to one of many Facebook pages, telling Congress and our government that you don’t support trade agreements which ravage the environment, kill farmer’s wages, and support toxic GM agricultural practices. The TPP is simply undemocratic. It threatens all our founding fathers worked to set up for the Republic. If the TPP passed, it would supersede and undermine U.S. federal and state laws, including FDA and Department of Agriculture rules and regulations. It would compel sales of globalized commodified food of uncertain and likely damaging origin, dangerous pesticides, and untested genetic and molecular content on consumers. Your choice will be gone, and even a meaningful glance at a label will be either pointless or will deliberately misinform consumers. As many of us suspected all along, labeling is just part of the problem. There will be no alternative to your lack of choice under TPP. You can also pass around this PDF which makes the TPP more transparent. Don’t let Monsanto, et al, run over your rights even more than they already have. If you don’t want to eat GMOs without even having the knowledge you’ve done so, this trade agreement must be stopped. They want to lower the population? Anyone who cannot see through Obama and Bieden’s BS should get a pig sticker to the back of the brain….